When asked which solar cooker oven I recommend, I always mention the Global Sun Oven. It was the very first solar oven I owned and it shows plenty of wear and tear. It’s more expensive than other versions, but its designers came up with creative solutions to common issues that made solar cooking more challenging than it needed to be. Now, this oven has been re-designed with a few more bells and whistles and the interior can now easily handle a 9×13 pan, which is the most popular size baking dish, at least in my house! The All-American Sun Oven is available only in the U.S., and it makes cooking by the power of the sun easier than ever. First, the oven is 20% bigger. It can accommodate that rectangular baker you love and bake 2 loaves of bread, side by side. This improvement is a very welcome one. Once I learned how to align the Sun Oven with the sun in order to maximize the cooking power of the sun, it was easy, but the All-American makes it even easier with an E-Z Sun Tracker. With a glance you can determine if your oven is situated properly. This will help your food cook more quickly. If you’ve been looking at solar ovens and wondering which to buy, the All-American Sun Oven is a winner. Check out the new All-American Sun Oven! I sure would like to win this. I have wanted one for a long time. I would be so excited to win this!!!! I would LOVE to try it out in Seattle’s gloom and drizzle — that actually doesn’t bother me at all but I fret about whether solar anything would really function here. I would love one of these! My husband and I are very much survivalist and prepping and have yet to figure out a way to cook without power. I believe an E.M.P. (terrorist or sun caused) will cause the apocalypse and I think this would be the greatest thing to have! I love this idea, I’m very interested in this. Would love to win the solar oven. What a great addition the sun oven is to being self sufficient. I’d love to learn how to use this! That would be awesome to win!!!! I LOVE your site and I would LOVE to win a Sun Oven. I went to the website and watched the videos. This company is doing a great job. Cool! I would love to win this. I am new to this and overwhelmed by the amount of supplies I will need to have. I definitely would use this. Have tried the homemade version with some limited success. This about the only device I haven’t tried! I would love to! A friend of mine invited me over for a meal cooked on their sun oven this past weekend. It was phenomenal! Maybe if I win I can return the favor! I would love to use one if these!!! as often as the power goes out that would be awesome to have. Ooh! this would be a great addition to our cooking supplies! it would not work too well today, but i am sure we’ll get some sun soon! This would look great on my back deck. This has been on my wish list for a LONG time! Would love to win it! I would absolutely love to have one of these!!! Oh, I SO want one! I’m working on making one from a windshield sun reflector …. but it hasn’t yet worked for me. Please? This would so help me cut down on my gas bill during these trying times of sequestration and furloughs. Love this solar oven! Thanks for the chance! Looks like a great solar oven and fun to use. Hope I win! If I win…I will give this to my Mom! This would be fabulous to have on hand, would just love to try one. This is the perfect solution to those of us that are subjected to Mother Natures occasional bouts of fury causing us to lose our power or those trying to be more “green”! Excellent product! This would be nice to use even when it is 90 degrees outside. Never want to run the oven when it is that hot! My wife would love this solar oven! Would love to start baking with this solar oven! On top of my wish list, if only my wish granter’s took me seriously. I would love to have one of these for baking bread! I’ve been wanting one of these for a long time now! Thank you for the chance! This is great! Something I’ve been looking for. Thanks for the chance to win it! This would make a great addition to my life style. I already use hand can opener, slicers, meat slicers etc….I plan to go all solar bit by bit in the next few years. This would be awesome! I have been shopping these and keeping my eye on this one! I would be so thrilled to actually win one! Boy would this come in handy when the power goes out!!! LOve it! Lot’s of sun in California to power this oven. Pick me! I love your site! Will be “sharing”. Please accept this as my entry! I have heard wonderful things about the Sun Oven. I would love to win. Thank you for the contest. This would be so awesome to have, especially like it takes standard size pans! Man….I would love to own one of these! Oh the wonderful things I could make in this and NOT heat my house up in the summer. Or, not have to worry about how I’m going to cook a meal. I’d LOVE to win! I would love to win this….thank you for the give-away! Oh! This sun oven has been on my wish list for a while now. Please pick me! Very nice! I want one! Oh I would love to win one…I’ve been saving up money to get a good one! Can’t wait to get one and try It out. Have always wanted a solar oven! It would get used a lot! The bigger size makes it better for my family. I have been wanting one of these for so long!! What a great prize!! This has been on my self-sufficiency list for a long time and I would LOVE to be able to add one to my supplies. I’ve been busy learning vegetable gardening, growing herbs and and stocking the pantry and this would fit in nicely with the rest of my homesteading/prepping desires. Thanks for that chance. Awesome! I’ve had my eye on one of these for awhile but always seem to spend my money before I can save up for one. Thanks for the giveaway. I would so love new of these! I would love to add this to my limited supplies! Crossing my fingers. I would love to have a sun oven! I saw one of these at a survival expo recently, would LOVE to have one! Awesome giveaway! I so wants one of these! This would be a great for me and mine! I have to stay out of heat so being able for my family to bake outside would help keep our home cooler! I would love to win this ! I`ve done DIY solar ovens with varying results. I’ve always been curious about these. If I win I can find out for myself what it can do. Thanks for the opportunity. would love to have this!!!!!!!!!! I have never tried cooking with a solar oven. It sounds like it would be a great project to do with the kids. Oh please! My family really needs this! The new improvements sound great! I think this would make a wonderful addition to my preps. Sunny summer days make me wish I had one of these to try. Fingers crossed! Thanks for the chance to win. Very cool oven! I would really love to win this! I want a solar oven soooooo bad! Thanks for the giveaway. I used to work at an electric company that put on teacher workshops and my favorite where the teacher workshops where we made cardboard solar ovens. I would love to win the real deal! I would love to win the solar oven. We’d love one of these! We already use our tiny, sunny balcony to grow food, dry laundry, and make sun tea… having a sun oven seems to be the natural next step, be useful during a power outage of any length, and the gas bill savings will get us to our dream house that much more quickly. So would love to play with this. This would be great in the Texas heat. No heating up the kitchen and plenty of sun to cook whatever you want. quite simply the coolest machine I’ve learned about in years! OMG – I want one of these … bad! I have wanted one of these since the first time I saw one advertised, but have not been able to afford one. . I lived in snow country for 31 years and many times we were without power, sometimes up to two weeks. I always tried to keep Sterno in the cupboard, but that was only good for a short time. This would be ideal for being without power for a longer time. I would love to add one of these to my stash! I would love to have one of these Sun Ovens for my family! With energy costs going up, this is a great way to save some money, and cook healthy meals for my family. Thank you for running this contest! I attended the class given by the owner of the Global Sun Oven company in SLC last year, and we have wanted one ever since. I would really enjoy cooking meals for my family in this oven, and helping protect the environment as a bonus! This is just what we’ve been looking for! Would love to win one! Come on random number picker thingy…pick me!!! I. WANT. ONE.!!!!!! I’ve had my eye on this oven for a while now! You’re such a wealth of knowledge! I love all you do. I’ve been wanting one of these since I saw it on your website. Good luck everyone!! I would LOVE to win this! I have always wanted one of these! Thanks for the opportunity! I’m getting older and weaker and would love to have the help of this new oven. I could really use this! I love the design. GOD’s speed on your website always. A solar oven is one of the many things that I would love to have in order to be more prepared. I can’t think of anything that would be more comforting then a nice casserole or pot roast in a bad situation, except maybe some chocolate chip cookies! I would love a sun oven!! I tried to make one and it was a complete flop! I’ve been interested in solar energy since I was a kid. It would be neat to get to try this out! I would love to use this. I use to make my own as a kid. We currently have the plans to build one, but I’m sure this would better. Would love to have this solar oven to use when my sister and I rough it at the beach! I would love to have a Sun Oven! I would love to add this sun oven to my preps. It would help me keep my family and neighbors fed! I’ve been thinking about buying something like this for a while, thanks for the review! I have wanted one since I started prepping! I would love one of those!!!! Cooking with the sun would be a lot of fun! I have a Global Sun Oven and LOVE IT, would love to win the All American so I can give one to my parents. Haven’t tried solar cooking since High School science. This looks easy! Found your blog through your book and I’m so thankful I did! Such a wonderful resource! Would enjoy trying one of these and winning won would be great! I would love to have the All American Sun Oven! What a great package. What a great unit! What a great giveaway! Thanks for offering this oven. I love my Sun Oven but it drives me nuts that I can’t get a lasagna pan in it. This would be great! What a great prize! I would love to win. Have grains, several grains, experienced bread baker, will bake various types of breads in THIS sun oven if I win it, for my big family and my great neighbors! I have use a old solar with little luck, liquid gas stoves, now I am living the RV (5th wheel) and would like to try living off the grid as I travel. As the money comes available will purchase if not winning, this and use as a daily cooking. What a fantastic give away! I’d love to have a Sun Oven. I saw one of these demonstrated at a preparedness expo. Great giveaway!!! Would love to have one. We could save on energy cooling house (only have window cooler) and be able to cook for elderly parents too if power is down. I’d love to try one. Oh I wish, I wish! Wow 9×13, huge improvement! I’d love one of these. I can’t think of a better prize! Thank you for doing this giveaway! Awesome oven. Would love to win one. I’m trying to be “greener” everyday. After being without power this weekend, a sun oven rose higher on the priorities list. This would be awesome to win! Would love one of these to bake items for the kids! An item worth having in your preps! This has definitely been on my list of things to buy, but the price makes it hard to justify right now. It would be WONDERFUL to win one! I made a solar oven out of cardboard boxes, newspaper, aluminum foil and a roaster bag as the window. It got up to about 175 degrees. That was just before Y2K. I wold LOVE to have one of these. Please accept this as an entry. Doing a lot of outdoor cooking this summer. This would be put to good use. This would be awesome to have. Oh, man! Those improvements are totally awesome! The sun ovens look like they’d be incredibly easy to use! Looks like a good piece of equipment. Winner or not, I am looking forward to trying my hand at solar cooking. I especially want to try a parabola to heat a skillet. I have tried making a home made solar oven and so far it has come up way short. Would love to win a sun oven. I’d love to win this. It would save me from muddling through a DIY. South Texas is perfect for Solar Cooking. We have been using ours almost every weekend as long as the sun is out, the old one is awesome, can only imagine how nice the new one is. WOULD LOVE TO HAVE A SUN OVEN!! Throw my name in the hat! I’m miss suzy homemaker. Would love to bake in it. Thank you for all of your hard work on this blog, I am a regular reader and I can tell you are helping not just me, but a lot of people get prepared!! Thank YOU!! And thanks for letting us have a chance to win!! Love the new size and woul love to have one of these in my backyard! Thank you for the giveaway! Thank you for yet another great giveaway! You rock! I would love to win something ( actually anything, LOL ) such as this and would love to experiment with some great tried and true recipes! It would be amazing to win this oven. Last summer we built an outdoor Italian woodfire oven so this would be a great solar compliment when we don’t want to fire the other oven to cook. We have implemented other solar (sustainable) items in our life and this would be great. Getting a sun oven has definitely been on my to-do list for awhile. Thanks for the opportunity! This would be such a blessing. It’s definitely on my wish list. Thank you for this opportunity. I would love to have one of these. My entire house runs on electricity and it worries me to think about cooking with no power. I can only store so much fuel for the grill, but the sun will always come out tomorrow! I really would be blessed to have this. I am trying to learn to be self sufficient and gardening and new skills everyday. This would be an awesome addition to our household. This would be great for baking in the summer. I have never used one of these, but would love to try it out. I would LOVE to win this. Thanks for the contest! This would definitely help with my move toward energy independence. I would LOVE to win this! As a single income military family trying to be self sufficient, this is awesome and I would love one but they are a but pricey! Thank you for the awesome giveaway!!! Oh! What a fantastic giveaway! This is high on my list of wants right now! This would be a great addition to our supplies! built one a few years ago but would love this one! I would love to learn to cook with the sun! Awesome! We are just starting our journey and need all the help we can get…turning teens on to this is difficult. My family and I have been learning and prepping for about a year now. It is a slow progress but this is on our list I hope I could win this because this is what we are working towards but prepping is expensive so we do what we can and would be a big help! I really would love to own one of these! This has been on my “wish list” for awhile. I have been wanting a Sun Oven for as long as I can remember! Would LOVE to win this!! We’ve been wanting one of these for a while – what a great prize!! I believe every hom should have one of these for good times and bad! WOW!!! This is out of my price range at the moment, but is at the top of my wish list, winning would bring a bit more prepping peace of mind!! Yes please. Since it is summer, this is a perfect time to get the Global Sun Oven powered up and cooking. Thank you! Would LOVE to add this to my preps! This looks fantastic!! Very cool solar oven. Would love to have one for my preps. I would live to win a sun oven. I have wanted one for so long but unable. Thank you for your great blog and work you do. I love this oven. What a great product! On my wish list! Hoping to get one this year. I’ve tried to make a DIY version with no success. I would LOVE to win this!! I love to grill and would love to have the Sun Oven ! I forgot to post my full name. This is me! I have actually built a sun oven from cardboard boxes and tin foil, and it works sort of. But decided immediately that I wanted one of these. It would be a tremendous blessing to my sister and I. God bless you. Wow! Thanks for having such a great giveaway! I get so much from your posts. I’m pretty much a newbie, only gathering supplies for about the last year as my tight budget allows. But we camp a lot and cook on a camp stove and open fire. The kids would really be into trying out recipes with this oven. What a great way to expand the possibilities if there’s no power! The best sun oven on the market. I teach both canning and basic prep classes (along with DH); we do not charge – we simply teach; I would love to try this and incorporate it into my teachings. Just can’t afford to buy one right now, or I would. I have been thinking about one of these for a long time but just haven’t had the money put aside yet. This would be great! Thanks so much for offering the chance to win! I would like to try one of these out. Great for being prepared or even a day out of the house. I want to win this sun oven! It’s on the top of my wish list!! I’m not a mom (yet) but I love this site! So much great information!!! 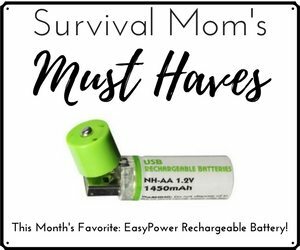 Thanks, Survival Mom!! I would like everyone else hope to win the sun oven! Cool! Sounds like it would be great to use in west Texas! Thanks. Win it or buy it, I will have one soon. I appreciate the chance to win it and enjoy your work. Thanks! I love your website & your radio program! I’ve learned so much about prepping from you that I am no longer overwelmed by it. Thank you for all you do. Would love to win the sun oven. Thank you for the great giveaway!! I’ve always thought that a sun over would be wonderful to have. It would be fabulous to win it!! These are awesome!! I would love to win one! Thank you so much!! This site rocks! Thank you so much! Would love one! This would really help us in getting ready. I am saving my pennies for one of these. Thanks so much for the recommendation! It’s hurricane and tornado season in S.Texas. This is something I’ve been wanting to add to the box of supplies. I really would love an All American Sun Oven. It’s on our wish list, but to win one would be amazing! Thanks for the opportunity! Please pick me! 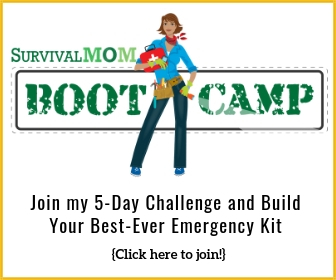 Ever since I got my hands on Survival Mom’s book, I have been trying to prep and catch up…. Please enter me in this drawing. Wondering if this would work inside in a sunroom. Winters in Iowa can be brutal. We always seem to have sunshine though. I have a sunroom with south facing windows as well as west facing windows. Don’t know of a sun oven would heat enough outside in the bitter cold-but would it work in a sunroom? I’ve been wanting one of these, now I’m glad I waited for the better size! Thanks! Thanks for this chance to win one! We live in California with almost constant sun and I would to have something on hand like this! You never know when I’m going to need an alternative cooking method. I have been reluctant to buy one of these because of the price. Winning one sounds great. What a wonderful prize! Always searching the sales and wishing! Here’s to hoping! Assuredly I could and would use this. God Bless! I’ve been using a foil lined dashboard shade, a tripod and a dutch oven to solar cook. Your choice has Everything I’ve wished mine could do. Please, please pick me! With the arrival of 90 plus degree heat lots of sun to cook with! Yes, PLEASE! New prepper – need help! I love that you can bake 2 loaves of bread at the same time. This would be great to use during our hot Georgia summers!!! I’m on the bandwagon with all those others who’d love to have one, especially as a gift. Thanks for the opportunity. Would love to have this oven! Can’t afford to buy one of my own. In fact, I can’t afford much in the way of prepping basics, but I try. I would love to try one of these. Think this would be a great item to use with our Girl Scouts on our next camp-out! I have been wanting a solar oven for several years and have not saved up the money for one. A win would sure take care of that! Want to cook with one and see how it works. I think it is an amazing product. Thanks for sponsoring this contest. I would love one – please enter my name! Eeeeek!! This is on my to do list. Winning would be great! I would love the opportunity to learn to cook on one of these. Thank you for offering such a great giveaway! Such a hot item to give away! Keep up the great blog. Have a great day! I would LOVE to have this. I have it on my list to make one. This would sure be better. Ready, set, go! I’ve got just the spot for it! Plenty of free sun here in MO….would love to win the oven. Son and I cooked pizza in a cardboard homemade cooker so imagine what we could do with a real oven!! Sounds like a perfect addition to my supplies. It’s now on my list. What a great opportunity to add to my to my supplies I’ve learned so much from your site and I look forward to checking it out everyday to see what’s new. Thanks Lisa for doing all that you do! Would love to give this my son and daughter-in-law, both military and both starting out in their new home learning how to garden; building a chicken coop; and all things survival. I tried to make one and failed! Would love to have the real deal! As much as I would love to have one, I would bet that there is someone else on your “list” that would never be able to buy one. Surprise them. What an offer!! We’ve tried 3 different ways to make a solar oven but can’t get over 180* even on a great day. Oh, to bake a cake or cook that meat. Dreaming! I just found your website, and really like it. I have gleaned many great ideas from it to supplement other similar sites. I wish I had kept the solar cooker my grandfather built years ago, but didn’t. Wow, if we only had foresight decades ago! This solar cooker would be great if I won it. Otherwise, someday I’ll have to buy one, if I can ever get that far down my list!. Thanks for being here with so many great ideas! I would love to have one of these, it’s been on my “wish list” for a few years now. I am really interested in Solar cooking. I’m looking forward to learning more about it. The Sun Oven is what is needed when the fuel for the stove runs out or some folks don’t have a oven. This would so awesome to win, I’m keeping fingers and toes crossed. What an awesome prize! This site and the book have been invaluable to our family. Awesome! Wow, cook and not heat up the kitchen or cook when there isn’t any power! Awesome! I would love to win this. It would make a great addition to my prepping. I would love one, but can’t afford it. To win one would be great! Ok, as a girl from AZ, living in AL, this is PERFECT! We have so much sun in either place I should be dark brown by now lol! I love the idea of being able to use this while camping, and just to save a little on the ever growing electric bill 🙂 Thanks for the opportunity! This is really cool. I can see it being pretty handy for camping and stuff. Been a fan for a couple years now, looking forward to the giveaway! We have just started learning about prepping and alternative methods of energy and equipment. My six year old daughter loves gardening and baking. She loves when we use candles instead of the house lights. This would be a wonderful adventure to take with her. Baking by sun energy. Right up her alley. Plus, this would be the first major piece of equipment we would have since we started educating ourselves on life change events. Thank you for this opportunity. What a great giveaway. Thank you so much for the opportunity to win one. Good luck everyone. I have wanted one for so long! Would love to win one! My wife are older and live in central florida and will have to bug in. This oven could very well be a life saver for us. Thanks M.
Would love to have one of these ovens. Every time I have the money saved, something would come up that has a higher priority. Thank you for the opportunity of winning one. I would so love one of these!!! good to see improvements being made, and we have about worn out our older model Sun Oven, but we still love it. Would love to win this so I can try cooking with a solar oven. i so want one of these! would love to see how they work at high elevation with the more intense sunlight. This would be a definite bonus to my preps since currently I do not have an alternative cooking source except a fire. Live in AZ and would love to use the 115 F heat for something yummy, and not just a big electric bill. Love this site, I use it often to help my family get prepared. Thanks so much for all the great info!! Would be soo very happy to win the sun oven thanks so much for offering this! And thanks for all the great info you put out! 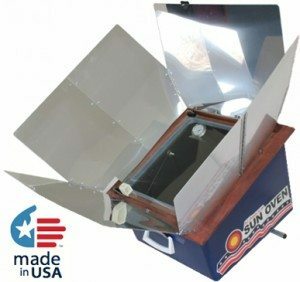 This All American Sun Oven would make a great addition to my preps! Thanks for the opportunity! Saw one of these ovens at an ARRL field day site. Quite a nice device, they had it up to 325 easily. I was just researching these today! I was having a hard time trying to choose which one to put on my wishlist but your description has definitely made it easier. I live in northern Washington state, so I’m not sure how effective a sun oven would be here, but I’d love to give it a try. Thanks for all the great information you post! Thanks for all of the updated information on the Sun Oven. I would love to win one of these! I would LOVE to win one!!!! Thanks for the opportunity and your blog!!! Oh goodness, I have the global sun oven and have been drooling over the larger sized All American Sun Oven! Nice size and man, that would come in handy around here with all of the sun we get. Not to mention keeping the kitchen cool. And how great to camping?! We cooked in a solar oven with our Girl Scout troop. This one is the “real deal”. I want to try it out! On the list!!! Hubs says we can make one, but his time is just about non existent. I would love to win this sun oven! I’ve been wanting one for a long time…it sure would help us be more self sufficient. I would love to have a chance to win this oven! I have been prepping for about 18 months now and the oven is the next thing on my list! This would be a welcomed addition to my family of 6…would help with the bread baking and meals! Thank You! I’ve been wanting to learn how to use a solar oven for a long time… having one of my own would be amazing! Would love to win this to offset the 20% pay cut that is about to hit me (yes, I’m a gov’t civilian about to be furloughed). Love your website and all the great help and advise you have to offer. Would love to win this oven and try my hand at solar cooking!!! Live in the SUNshine state. Could really catch some cooking rays with this! Thank you for providing the opportunity to win a great piece of preparedness equipment. My mom had one but when she passed away, my sister gave it away. It was fun to use and let us cook on days when it was too hot to turn the oven on indoors. I would love to have one again. Would love another option to not turn on the oven! This would be an awesome addition to our emergency kit! I would love one because I hear everyone raving how good everything tastes when cooked in the Sun Oven. A Sun Oven is definitely on our wish list. Thanks for the chance to win one! I am so impressed with the new solar style of this oven. I love that it can accomodate a larger baking pan for goodies or the main course. I also appreciate that the glass is thicker and it bakes hotter. This would be wonderful to own. I have been wanting a solar oven for years. Would love to win this! This is on my list of “wants” so how wonderful it would be to win it!!!! This has been on my wish list for a while…pick me, pick me! Definitely on my wish list. Sounds Like a winner, I like that is made in the Good Old USA! I’d love to own this! Thanks for giving us all a chance! Sorry. Last comment had the wrong email address. Opps! What a fabulous give-away! Would LOVE to win! Thanks! Would live to learn to cook in o e of these! Would love to have this solar oven, it would work great to sun dry my produce here in soggy Oregon! Just even getting the recipe book would be neat. It would help make the best use of our “U-Pick” farm savings if it could be dried using the sun, lets you get on with the other chores without having to watch everything! I would really love and use this oven big time =)! I have always wanted to try using solar and this oven just sounds amazing. In Nevada there are many people who have to live off grid because of where the jobs are, totally not by choice. I would sooooo share this little prize with my friends who all live off grid and we could all learn together. Ooh boy I would love to win! I would use this ALL the time, not just save it for an emergency! and the fact the it is made in the USA makes it a treasure! I’m new to self-reliance and the solar oven would be a fabulous welcome to my growing supplies and education. Thank you for all your wisdom and fun contests like this. I have never heard of these. I would love to win one as I have just begun preparing emergency essentials. Thank you! This would be fun to try! Awesome giveaway! Would love one of these. oooh! Hope I win! I have wanted one for awhile! Excited about the new size! Thanks for the give away. Just started experimenting with solar power. This would be a fun new adventure. I’m trying to learn solar cooking this summer with a homemade cardboard & tin foil oven. So far, and sadly, I can only get the temps high enough to soft cook an egg and that took 4 hours. I dream of a Sun Oven of my own. I love the solar technology. The more things we can do with solar power the better. This oven looks like a lot of fun too. I’ve been researching these and have been wanting to get one! Would really like to give one of these a try. Good luck all and congrats to the person that wins. I am 72 years young and have been working for three years to get better at raised bed gardening, raising livestock, and methods of storing foods. I just bought ten acres and am going off the grid with solar and wind generating electricity. A solar oven was an expense that I thought was outside my budget. It would bring it all full circle. I bought a Global Sun Oven just for baking bread and love it. The larger size and new features of the All American sound wonderful. Thanks for the information and chance to win. Cool giveaway! I would love to upgrade. I bought the global version last summer. It is great, but the new size and help to position sounds even better. Two summers ago I made a diy one from the instructions here http://www.backwoodshome.com/articles/radabaugh30.html on the first use it made it to 350F, about 300 after that. I think it would be even better if I had preheated the cardboard before gluing the aluminum foil down. The cardbord shrinks causing wrinkles which makes it less efficient. Hope that helps someone else trying to build one! Wow! This looks and sounds amazing. What a wonderful addition to my cooking options this would be. I’d use this every chance I could – love to lower my carbon footprint! I borrowed an oven like this about a month ago for a high school environmental science class demonstration. We got water to heat up to 85 degrees Celsius (well past pasteurization temp) very quickly, then we made s’mores. (Not an ideal use for an oven like this, but it was my first experience and I didn’t know how much to expect.) I would LOVE to have one of my own to experiment with during classes and then to USE (for longer periods) while away from school (in nature or at home). Just waitin’ for the power to go out so I can try the new Sun Oven. Amazing Giveaway! Would love to have this solar oven! I have not seen or heard of anyone I know use one of these. I would love to give it a try at one of the summer get togethers..would be a great alternative to standing over a stove indoors. Thanks for the chance. What a blessing you are to people who are trying to learn how to prepare for whatever life throws at them. This would make a great addition to our household. Very cool giveaway! I’d love to have this oven! We have lost power in the past and typically use the grill or camp stove, but an oven would be an awesome addition to our “preparedness pile”! Thanks for the opportunity! My last post seams to have disappeared. Decidedly worth re-posting for. Thank you. Would love this! A great way to go green and not have to rely on the electric company!!! I have been working with my grown daughters to show them how to live without modern conveniences . This would be a great gift to give to them. I would love to have this oven! Could even come in handy on those long hot summer days. Thank you for your contest. I would love a sun oven. I have been wanting one of these . Thanks for the chance to win it. Wow, this looks like a great product! Love the upgrades, and perfect for emergency preparedness. Thanks for the giveaway opportunity!! I would love to win a sun oven! Thank you!! I would LOVE to win this! With a large family to feed, and living in the hot south, it would be WONDERFUL to be able to cook this way, and the larger size (9×13) makes it ideal for us! 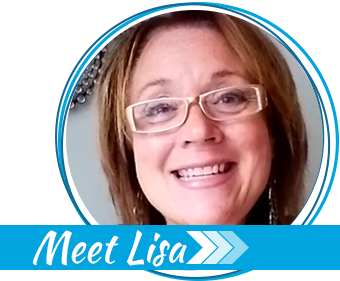 THANK YOU, Lisa, for all you do to educate and inform us! Your give-a-ways are just the frosting on the cake! Would be great to have !! Always thought about making one, but havne’t got around to it. Winning one would solve that problem. Please accept my entry. Thank you! Oh what a great prepping product! I think my post didn’t go through. So I’m reposting as this would be an awesome win. this is an amazing opportunity, thanks for offering it! I would love to have a solar oven! Such a great giveaway! Thank you for the opportunity. Great to cook with in the summer heat! I’d love to win this as it would sure help. Thanks. I really would like a solar oven! I have been using a sun oven for almost a year and absolutely love it. It is amazing what you can do with it and when you take out the amazing roast or whatever it is cooked to perfection you can hardly believe it. I would love to have the larger one because I cook for a large family at times. I now have three of my children’s families and two grandaughters using a sun oven because I am constantly bragging on it. I have always wanted one. Looking for alternatives just in case. Great review and awesome giveaway. Would love to add this to my preps and can see myself using this often. I’ve had a sun oven on my list of needs for a long time, but could never afford it. This is such a great give-away! A great Solar Oven is on my list of preparedness items. Thanks for the opportunity to win one!! I have always wanted one…fingers are crossed that I get this one. I’ve been looking at getting a sun oven–saw someone canned butter with it. Sounds interesting! Thanks for offering this up as a contest! Please accept my entry,thank you! This is a very exciting giveaway! Would love to win! I’ve been looking at these for a while now, definitely on my wish list, but out of my budget for now. Great give-away, thanks for the opportunity!! Just starting to get ourselves into off-grid mode. This oven would be such a blessing. Thank you for all you do! We lose power here in the foresty state of CT. A Sun Oven would make those power outages so mucho the bearable. Thank you for giving one away – so generous! Boy, that would really be great to have! Our family could really use a sun oven. I have always wanted a Sun Oven! I’ve spent the last several months learning to bake breads and other yeast based doughs (gluten free and regular) and all baked goods in fact. I would love to try to conquer this new form of cooking as well. It could be a real asset in the summer (to not heat up the house by turning on the oven) as well as a general means to save money on fuel costs and not utilize any of the earth’s natural resources. I love the idea of harnessing the power of the sun. It’s a win-win no matter how you look at it. Thanks for the opportunity to win this. We cook in Dutch ovens , but, I would love to have one of these so you don’t have to worry about starting a fire. We are in a drought here and can’t have fires. This would be so awesome to have and not heat up my kitchen. 110 degrees outside in the summer here. Thanks!! Congrats again on 4 years of making a HUGE difference! I am a fairly new prepper – a little more than a year, now. The Sun Oven has been on my wish list for quite some time. My focus has been on prepping to stay-in-place, but I certainly have a BO plan, too. Some of my tools, though, I have practiced with and put into use, just so that I will be able to use them in a time of need without having to learn a new skill under survival pressure. I would put my new Sun Oven to instant use and learn to use it and enjoy it. Even if I am not chosen as the winner, I will probably be adding this item to my stash very soon – it just seems like an essential tool! Thanks for the reminder!! Living in the Valley of the Sun, I think I need one. Know I could’t go wrong with one of them since I live n hi-desert with triple diget temps. I wish me LUCK n winning this! I have been saving for a Sun Oven and really like the 9×13 size option……my 3 mo. supply is growing slowly, and winning this prize would really make my day! Thanks for all the practical information, Lisa. It is good advice even if we never face a major catastrophe! This is on my “to get” list! Thanks for the give away. This would be a great addition to our preps. Another great alternative cooking method! Wow, that would be fantastic! It’s on my wish list but money is tight enough that we aren’t there yet. Thanks for this chance! What a great device. Thanks for doing the giveaway. I would love to have one of these… have been drooling over them for several years…. economy is so slow not enough left over to purchase one 🙁 but it is on my list! 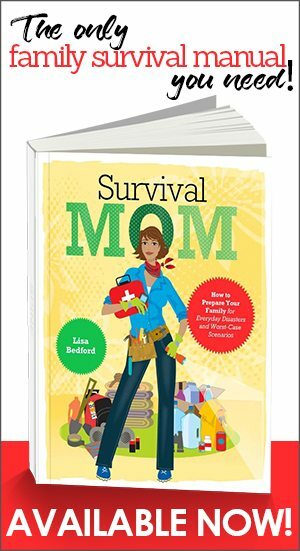 I just found this website the survival Mom, it’s awesome . I’ve never seen this Solar oven, but is sure makes sense. Use it for camping and in a disaster! Happy Aniversary Survival Mom. Thanks for all of your help. My son and I just finished making a water still (3 foot hole in the ground covered with plastic)…we got two cups of water! We thought, now that we can get water, wouldn’t it be nice to cook outside, too? We are slowly working our way to being self-sufficient! This oven would be perfect for the bread he loves which we currently bake inside with home-ground wheat. Thank you for your consideration! I love the larger size of the new solar oven. When you have a big family it would be so nice to be able to cook full sized casseroles for the family in lean times!! I’ve been wanting to try a solar oven for a while now! This is on my wish list. Thanks for your great website!! All American Sun Oven renews American innovation with a technology that rivals the “kitchen match.” I consider it a “must have” in an effort to challenge todays’ energy needs, and to show the path to a new energy future. You have been “my gateway” into trying to be more prepared for things in life. I always seemed to have an unsettled feeling that I should be doing something to help my family and others should there be a disaster of some sort. I remember when I first heard of your book and website through a couponing blog. I felt at home right away and it was great to learn all I could from all of the hard work and effort that you put into preparing and your website. All of your organizing and lists have been a good fit for me in the way that I like to approach projects. You have made preparedness seem so cool and feminine that it has been easy to reccomend your website to other women. I have bought 4 of your books because I keep giving them away! Thank you so very much for all that you have done to help not only myself but others. I would love to win this oven. Has been on my wish list for a while. My wife would love this. I would be a hero if I got it for her. I love my sun oven but I love the upgrades that have been made to the American Sun oven. I think if I won I would gift my current sun oven to my mom and enjoy the bigger inside space and cool sun site of this model. So awesome! Our family would really enjoy a sun oven and use it a lot! Thank you! This is on my wish list! I would love to win this! What a great contest! I’d love a sun oven. This will be a blessing to anyone that wins it. I would like it but I know who ever gets it will LOVE it! I’m not sure you will even consider me since I live in South Africa, but this would be an amazing opportunity and I have to try. I have been planning to buy one but have only looked a cheap ovens which produce far inferior results, but that would be all I can afford. I have even bought some cheap black pots to use in an oven but the oven is still out of reach financially. Why do I need one, well I live in Africa and we get sunshine every day all year round thus my intention would be to use it daily as the price of electricity has increased fourfold in 5 years and is to continue increasing by 8% a year for another 5 years. Thus we have had had to implement electricity savings at home which is good for the environment but hard on the finances. My intention is to use the solar oven for most of my families cooking except for perhaps some frying or grilling, thus having a quality and efficient product would make our lives easier. Also being prepared in Africa is not an option – it is a way of life. Apart from the cost of electricity 3 and 4 day power failures are a reality, thus anything that allows one to be more self-sufficient makes a difference, which is why I read your blog. Looks great. Real usefull when the power is out after a hurricane here in Louisiana. Wow this one sounds great! I live in Northern Texas, this would be such a wonderful thing to use, to be able to save heating up my home in the 100+ days of summer. have seriously been drooling over one of these for a loooong time! Oh, here’s hoping… This is one aspect of my preps I haven’t done anything with yet, in spite of trying to cobble together a sun oven with car shades. Some things are better left to the pros. Awesome contest! Thanks for all the effort you put into the site, facebook page, and your book – I learn something new every time I read your work! I’ve been wanting to experiment with a solar oven! I’ve wanted to try one of these for a while! Love the size of this sun oven! I must have one, or more of these! Sunsational! Would love to win one, this is on my list to get. Thanks! Oh, goodness! I would love one, please! My kids and I would love this. cooking with the sun is awesome! Thanks for the chance to win this! Would LOVE to win this!! We’ve got enough sun to make good use of it! Its been on my list for a while! I would love to win one of these. It would greatly with my preps. THis is the best use of cooking to be found. A trio of the sun, the oven and me. This is something I’ve been thinking about getting. It would be a fun science project for the kids too. I am brand new at being a Prepper and a Solar Oven looks awesome! Thank you for the chance to win one! I would love this oven so much! Thanks for the chance to win one and for your website! Would love to put a solar oven to use in the hot Texas sun! Curios, who is the lucky winner?